People In Arizona Offended By Middle Eastern Dust Storm Words? According to the NYTimes, some people in Arizona are offended by the term “Haboob” when referring to dust storms. I don’t know if the short NYTimes article is being sensationalist or if there are more than a few people cited in the article that are actually offended. Not everyone was put out by the use of the term. David Wilson of Goodyear, Ariz., said those who wanted to avoid Arabic terms should steer clear of algebra, zero, pajamas and khaki, as well. “Let’s not become so ‘xenophobic’ that we forget to remember that we are citizens of the world, nor fail to recognize the contributions of all cultures to the richness of our language,” he wrote. First real monsoon rain of 2011 in the Albuquerque & Rio Rancho area, and first real rain in about 6 months. Captured on a Fuji Finepix F550EXR, edited in Apple FinalCut Pro X and uploaded to YouTube. Wendy Tremayne writes “Flat Tires in the Desert – The Thing About Tourists & Locals” about being a celebrity in a tourist town. For five years people have bobbed their heads over our fence, climbed it to look in, and waited at our gate to ask for a tour. We’ve had to sneak in our back ally to avoid what at times is a flood of tourists. We skip getting our mail afraid of who may be waiting outside the gate. We finally got the locals and store owners to stop telling tourists that they have to check out Wendy & Mikeys place. No they don’t. We have nothing to sell. We did not make a life decision to work in tourism. What kind of people go to someone’s private residence and request a tour? Does Arizona's Dust Storm Mark The Beggining Of The Monsoon? In New Mexico and Arizona we are waiting anxiously for some rain. 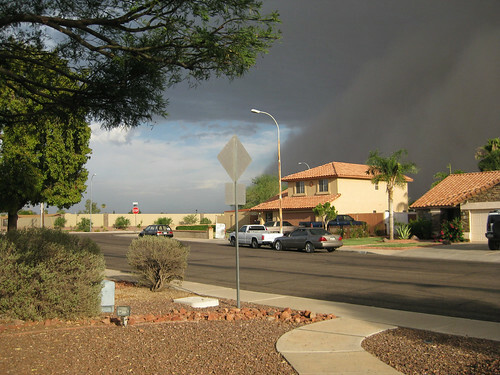 Arizona’s July 5th wall of dust known as a haboob seems to have marked the beginning of the Monsoon. These walls of dust moving into the Phoenix area are not new, I remember them nearly every year when I was growing up. This year it was a particularly large one. The weekend outlook from the NOAA shows the seasonal shift in winds and moisture from the south.